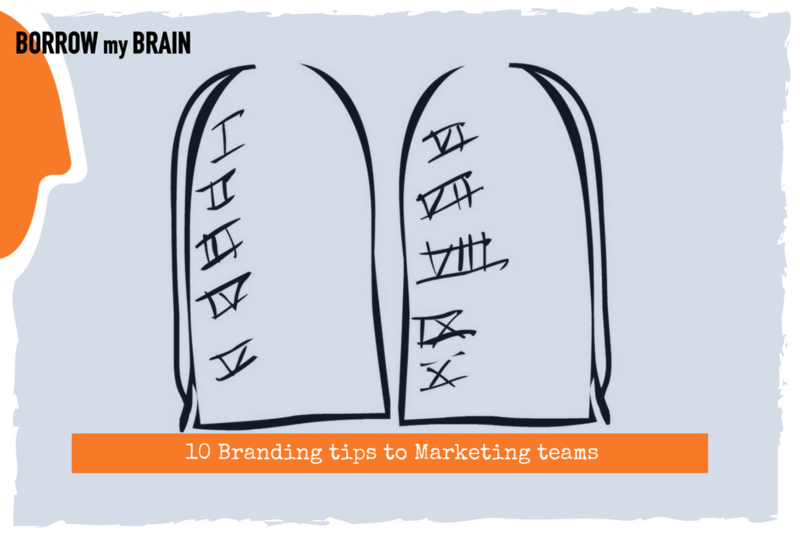 10 Branding tips we give to Marketing teams can be summarized in one phrase: “It’s ten years later. It’s time to wake up” …and check if your Brand is fit to the new market context, channels, and consumers. Now scaling #borrowmybrain we get to introductory meetings with many Brand owners. Great variety: an IT company, a Telco giant, an olive oil exporter, a scaling startup, and a consulting service. They are all troubled with various KPI’s, projects, growth and sales phenomena. Their worry factor is evident. But underneath any phenomenon or issue they face, they all have one common issue at hand: if their Brand is fit to the new market context, channels, and consumers. Most of these Brand owners have built their Brand franchise and reputation long ago, meaning they’ve introduced it, grew it, and become happy with the sales reported. Unfortunately, we are already in a completely new era. So, what do we tell them? We are experiencing a fundamental paradigm shift. From the “Information Age,” we are moving towards the “Reputation Age” in which information will have value only if it is already filtered, evaluated, and commented upon by others. From a Trip advisor or Facebook comment, up to influencers’ communities. From a small physical store experience to an e-shop, or an app. The reputation has become a central pillar of collective intelligence today. Reputation touches almost everything, guiding our behaviour and choices in countless ways. For a catering company, a lawyer, a coach or a multi-billion business. Reputation is the gatekeeper to knowledge, and the keys to the gate are held by others! The way in which the authority of knowledge is now constructed has nothing to do with your company’s history, heritage, or your big budget. Companies are reliant on what are the inevitably biased judgments of other people, most of whom we do not know. Why is it so powerful when the criteria by which people and things are defined as good or bad? Why do we care so much about how others see us that we try to influence their opinion? No, it’s not sales. It’s not being a leader. It’s not being respected. These are the cliche goals of the old-world. Find again your purpose-fit in a changing context and in the transformation. You can’t pretend that you know what you do, because you were doing that for years. Global economy hubs, Mergers, new entrants, the influence of the Internet and social media, regulations, communities, ethical issues, as well as the countless ranking systems that characterize modern society …all, contribute to the creation of formal and informal reputations, that should worry you as a business owner or Marketer. Companies must rethink the relationship between their reputation and their actions, empowering its resources to rethink “who we are” and “why we do”, what we do. Protect your Brand. It’s the only equity you have to grow, to sell, to partner… Be aware that a lot of scrutinies are a new reality for companies. Many times companies try to defend themselves from haters and hecklers, or from the “fake news” and other misinformation and disinformation techniques that are proliferating through societies. What a competent company of the digital age should be doing is: reconstructing the reputational path, doing strongly engaging actions, contributing, being transparent, and 24/7 figuring out the agendas of those communities or authorities that question its credibility. Does your company wants the fruits of advertising and (still) mass promotion without the cost of it? Do you want to be seen as a society’s contributor? An innovator disrupting your segment? A company that introduces new solutions for CX and experiences? Whatever position you wish to attain, show it with actions. There are people expecting (or questioning) what do you stand for, through so many alternatives they have. Even those that on a daily basis doing business with you. Your digital presence, customer systems, operations and experiences should be your only focus. Old-timer customers of yours slowly evolve in the digital sphere, new entrants come in your market, and new insights and needs drive consumption through preference and affinity. B2B and B2C the same (channels converge). Your digital activation in technical services and how they find you online, an e-commerce effort, an online press office, special promo-landing pages, customer support centres, and value-exchange guarantees, post-purchase. What do you market online? How easy is it for them? How pleasant is the journey with your company? Before, and after the sale. Supporting, answering questions, giving solutions to customers. I ran into the expression ‘Inbound’ for the first time 2009 in Stockholm. Over time I have realised that it’s not a methodology to do online business, but a committed way to visualize/think/act upon the needs of people – only for them. The Inbound methodology requires that you shift mindset. If you are really to survive in the Transformation, then revisit your customer needs and preferences. Get to know how it is critical to them. What challenges they face. How your offering is a relevant solution to their problems. For which reasons they engage in brand-relationships. Then, produce and offer products and solutions that only meet these Insights. Nothing else. We have to stop the corporate nonsense of “customer-focused”, while we keep the same products, prices, access points, and practices of the 90’s… Be genuinely interested in their expectations, habits, behaviour and needs. Get the the Borrow My Brain e-Book. Most of the times companies “transfer” their operations, profit-margins, desirable outcomes in their Customers lives and online experiences. This is they fail to achieve their targets. You should realise that peoples’ expectations and behaviour have changed and this already affects your company. Treat audiences exactly like they want to be treated, off-and-online. Fast load time. Excellent personal service. Acting upon complaints. Building communities with added benefits. Offer them simplicity from a click to a payment process. Offer customer support in every industry you’re in. Be relevant to their desires. Packaging that fits their lifestyle. Don’t use the old-school top-down approach. You won’t survive if you don’t hear them (read an example for Banking). Contribute. Incubate Talent and innovative patents. Help communities and local groups. Even at a competition, that you will launch do it with partners. Co-create solutions. Bring your customers in a permanent consumer panel, advising you on product/service innovation. All these apply from the food industry up to a microchips’ production plant. No, it’s not a Corporate Social Responsibility plan anymore. It is a social widespread insight. People around the world, in many associations, public petition groups, and through surveys all state that the corporate world isn’t giving back to society – this will increase as a public, real, human truth insight. I believe that the actions of too many companies are out of step with societal expectations, and we are not doing enough about it. Think about the areas of data privacy, gender equality, sexual harassment, income inequality, environmental protection. What is your company doing about those? Go out. Talk to your partners and customers. Lack of leadership visibility is crucial. No, it’s not anymore enough to give an interview on your financial results or deliver a keynote speech. Our Societies lack leadership and future-looking minds. If you own a business plan (owner or manager) you are expected to represent the company, organization and the brand experience in the eyes of all your stakeholders and primarily Customers! Nothing more to say; it’s a business theory item. Don’t ask and don’t accept from your agency partner exquisite answers to the wrong problems. Don’t focus much energy on one area (the shiny object syndrome) when you should be focusing on the real problems. Marketers and Agencies serve the ‘exquisite answers to the wrong problems’. Few revisit the Brand core, the online experience’s Why’s, the company systems that don’t work and the parity products (the ‘me-too’ ones). Many give intense focus on social and digital strategies, original content creation, multi-channel SEO and sentiment and advanced uses of data and analytics, while they don’t give any attention to the strategic big picture and the company’s disadvantages. All the digital bells and whistles we harness won’t have nearly the same level of impact that exquisite answers to these questions will have on the reputation and future of any organization. Others neglect to have a Workforce Talent plan for the next years ahead. In other words, they don’t care for bringing-in new Talent, c0mpetence and skills. Leaders of the past, might not survive through Transformation. Ten years ago we were fed a delusion. The delusion was that consumers loved brands and wanted to “join the conversation” about brands, and read about them, and share their enthusiasms for them with their friends. It was an infantile delusion but it was powerful. And yet the fantasy still lives. Companies feel ‘protected’ in their routine, scale, budgets, and may-years of history. They still believe that their legacy will continue. Without any change to the product portfolio or their commercial and organizational practices. It’s ten years later. It’s time to wake up. Yes, it’s time to wake up. Otherwise, the speed fo Change will be a violent force.